I carried a 9mm Heckler & Koch MP5A2 on SWAT operations and patrol from 1990 until 2009. My gun was #364 and she was my assigned weapon the whole time. Together, we went on hundreds of callouts, buy-busts, and warrant services over the years. I kept #364 stone stock, except for the Surefire light kit up front. That’s all the technology I needed for close quarters battle. I loved the three point sling, the curved thirty round mags, SEF trigger group, and the left-side charging handle. The adjustable diopter rear sight and front hooded post were simple and fast to employ. I could change those 30 round coupled mags in my sleep: Cover! Working parts back, mag off, mag on, working parts forward, Ready! I first saw the “H&K slap” in the movie Die Hard, where the gun is loaded by slapping the charging handle with the left hand. It looked cool then and it looks cool now. It was also taught to us as the proper H&K way to charge the subgun. My MP5 functioned flawlessly for all those years. With regular maintenance by our armorers, #364 never failed a function check or real pull of the trigger. Its accuracy was better than mine. After many thousands of rounds downrange, I was supremely confident in our combined lethality. 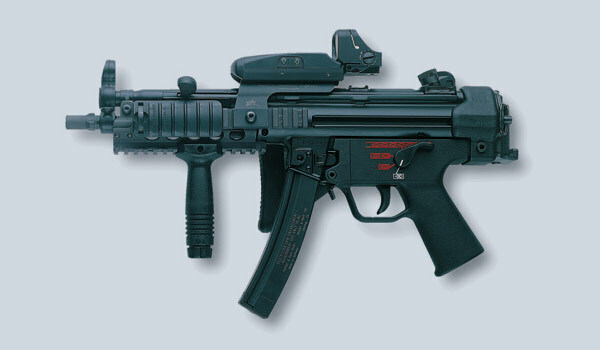 The Heckler & Koch MP5 excels at room clearing, the most important function in hostage rescue. It is short at 27″ with the fixed stock, extremely light at 5.5 lbs, and a master of control in full auto fire because of its recoil-operated delayed blowback bolt system. Introduced in 1966, the MP5 has been the gold standard in CQB for forty years. MP5’s have been fielded by elite counter-terrorist teams of British 22nd SAS, German GSG9, French GIGN, Navy Seal Team 6 (DEVGRU), Army Delta Force, FBI HRT, and others in the grim business. 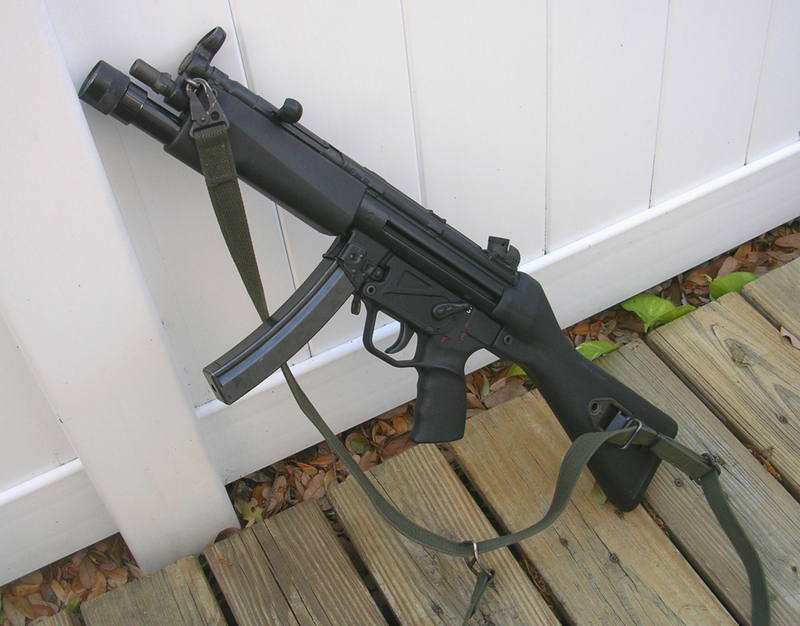 …And my enthusiasm has waned for the H&K MP5 as a daily carry weapon. Something changed. The Los Angeles North Hollywood bank robbery in 1997 was foreshadowing. Body armored, assault rifle-wielding bank robbers were a wake-up call. L.A.P.D.’s patrol division was not prepared. More police incidents have followed with “up-armored” suspects. For me, personal experience pulled me away from my beloved submachine gun. Our SWAT team began seizing more AR-15’s and AK-47’s. And then there was the body armor. We also began seeing ballistic vests in the arsenals of criminals. 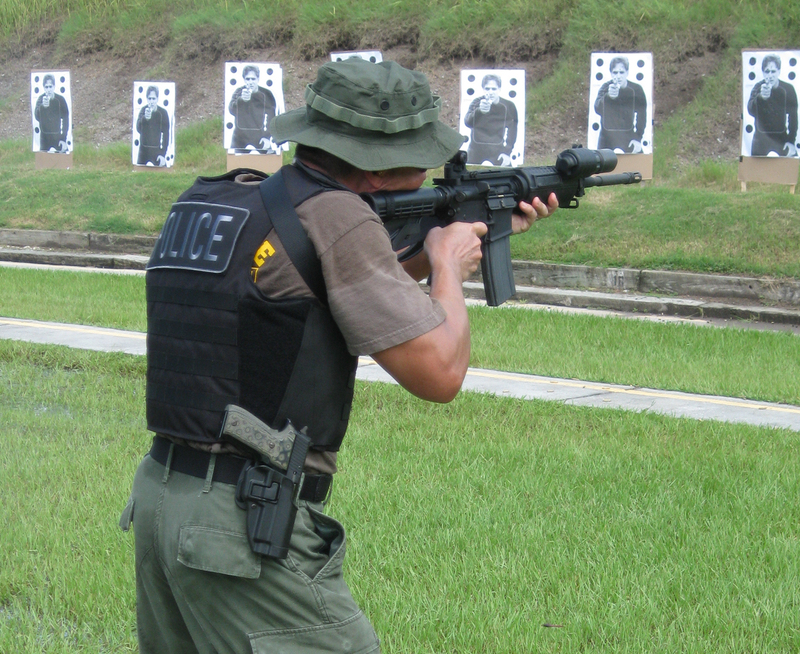 Body armor is not illegal for a citizen to own in Florida, but it is an offense to wear it in the commission of a crime. As if that penalty enhancement is a deterrent. Of course, we practiced body armor drills with the subguns, but the lethal targeting areas are small and moving in the real world. My confidence was falling in the pistol caliber submachine gun. I have now gone full circle from a SWAT issued Ruger Mini-14 in 5.56 X 45 mm, to decades with the 9mm MP5 subgun, and currently on to a Rock River LAR-15 in 5.56 X 45mm. Having an option, I chose to take the AR-15 as my primary patrol weapon. 5.56 will take down the targets that 9mm won’t. Sadly, #364 went into the hands of a SWAT FNG, who was probably about four years old when it was made. She is still a fine gun. It is tough for us old guys to admit when it is time to make changes. Ask my wife. But safety is more important than nostalgia. Most of today’s threats are well within the H&K MP5’s legendary fight-stopping capabilities. For the rest, I needed to feel prepared. Find out what eventually became of #364 here. 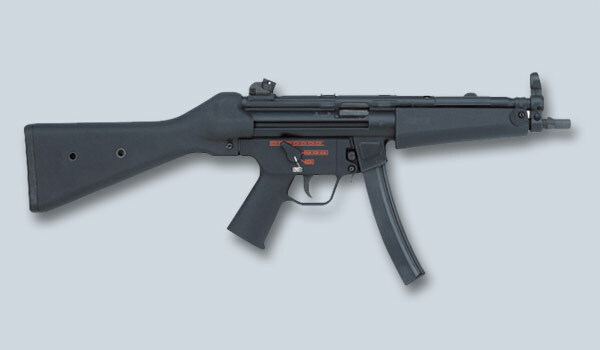 This entry was posted in Firearms, Street, SWAT and tagged H&K MP5, Heckler & Koch, Police SWAT Submachine Gun, Submachine Gun. Bookmark the permalink. So are you changing sidearm to an FN 57? That one is not my call. The 5.7 X 28 is an interesting round. Time will tell. Now if HK were to make a 5.7X28mm variant of the MP series… Preferably one that looked and functioned like an MP5… Nostalgia + Ballistics = the Future? Im no engineer but its just a thought. That would make for one sweet SMG. The 5.7 is an FN-designed cartridge, however. H&K made the 4.6x30mm round as a direct competitor to the 5.7. An MP-5 chambered for their MP7’s 4.6 bullet would be a very nice gun. Yeah thats true! 5.7 is easier to come by these days I think but dang a civilian version of an MP5 in 4.6 would be incredible. Im hoping to get a clone pretty soon since HK are hard to come by and expensive as all get out. Found this page looking for persuasion on whether to get the Mp5K PDW SBR or go for the A3 style with retractable stock.